From industrial cables and connectors, to ruggedized designs for harsh environments – we can design and build a perfect solution. Fiber Connections has designed and built many custom cable assemblies for our customers over the years. We have experience with fiber to the home, fiber to the tower and to the rooftop as well as standard data center and communications interconnection needs. As a technology driven company, we listen to the customer’s needs and then use our deep knowledge of fiber optic connectivity products to put together just the right design. 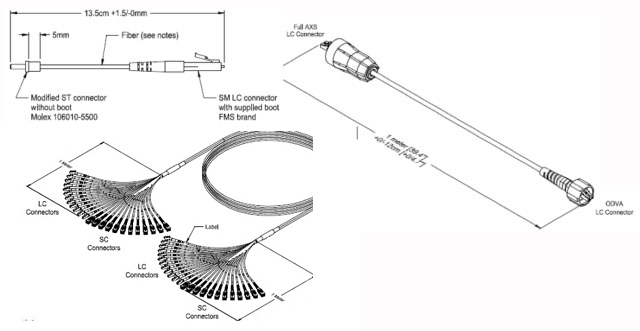 We have experience with tight tolerance fan-outs, ODVA connectors, long trunks shipped with enclosures… There isn’t much related to fiber optic connectivity that we have not seen. Contact us to discuss your special connectivity requirements – a solution may just be a phone call away.